Search for all "p107 Lysate"
The protein encoded by this gene is similar in sequence and possibly function to the product of the retinoblastoma 1 (RB1) gene. The RB1 gene product is a tumor suppressor protein that appears to be involved in cell cycle regulation, as it is phosphorylated in the S to M phase transition and is dephosphorylated in the G1 phase of the cell cycle. 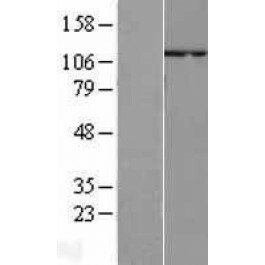 Both the RB1 protein and the product of this gene can form a complex with adenovirus E1A protein and SV40 large T-antigen, with the SV40 large T-antigen binding only to the unphosphorylated form of each protein. In addition, both proteins can inhibit the transcription of cell cycle genes containing E2F binding sites in their promoters. Due to the sequence and biochemical similarities with the RB1 protein, it is thought that the protein encoded by this gene may also be a tumor suppressor. Two transcript variants encoding different isoforms have been found for this gene. [provided by RefSeq]. Transcript Variant: This variant (2) differs in the 3' coding region and 3' UTR compared to variant 1, that causes a frameshift. The resulting isoform (b) is shorter and has a distinct C-terminus compared to isoform a. Publication Note: This RefSeq record includes a subset of the publications that are available for this gene. Please see the Entrez Gene record to access additional publications.